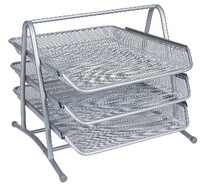 Q-Connect 3-Tier Letter Tray Silver KF00822. Stylish letter tray, accepts A4 and foolscap paper. 3 tier unit. Non-marking rubber pads. Approx Dimensions (CM): D36 W30 H6. Approx Weight (KG):1.37.